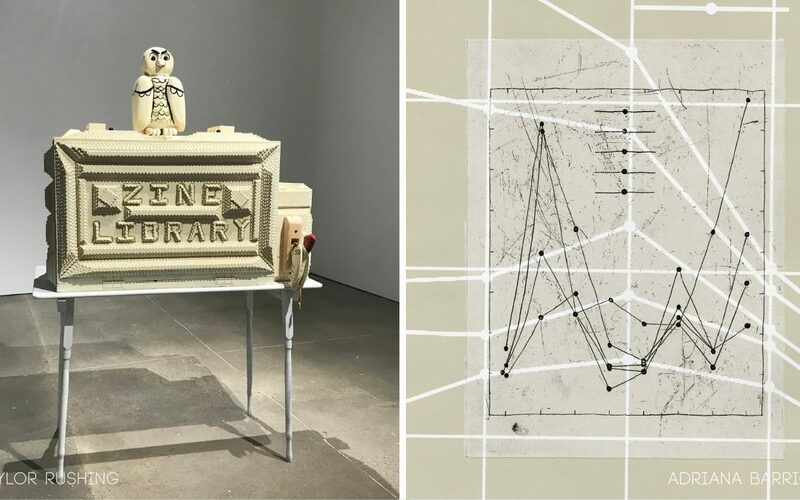 In collaboration with the Art + Literature Laboratory, we’re proud to announce the recipients of the 2019 ALL Prize, an exhibition award for our 3rd-year graduate students! Long Range Signal, the Master of Fine Arts exhibition by Adriana Barrios, utilizes direct experience, scientific data, and live feed video technology as a way of recording environmental changes happening along the California coastline, expressed through etchings, screen prints, works on handmade paper and large scale video projections. Taylor Wright Rushing’s Master of Fine Arts exhibition, Slumgullion (a word for an improvised hobo stew made from a comprehensive search of one’s pantry), focuses on the slippery and often distorted nature of storytelling through video, 2D art and sculpture. Rushing’s wooden works, made of hundreds of pieces of layered wood with thousands of hand-whittled cuts, discuss the confluence between modern DIY culture and American vernacular woodworking. His work in video and performance art connect us to our past while aiming to level an audience through humor and accessibility.